I thought it was really hot in NYC, and then it got even HOTTER. I have been kind of hiding away at home, as close to the air conditioner as possible. Its gross. I still need to work out how to get to the neighbours pool in the least creepy way possible. 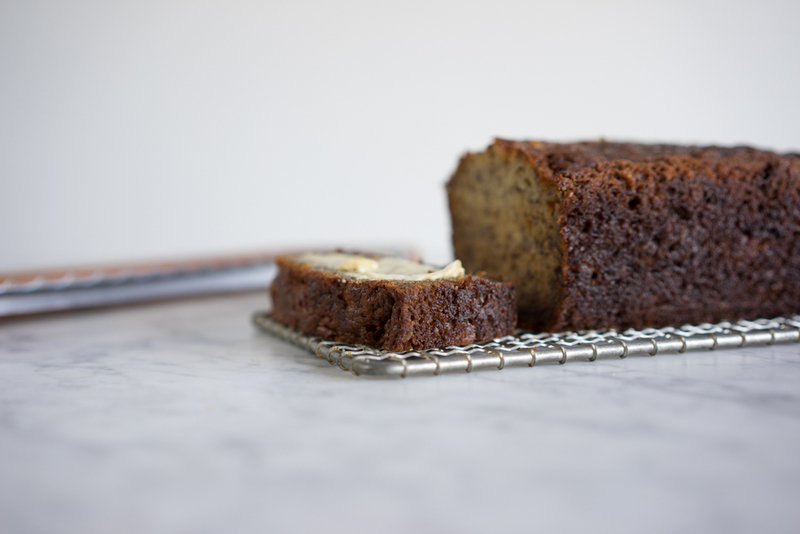 Everyone needs a great go-to Banana bread recipe, and this is ours! It is super simple. You can make the whole thing in the bowl of the mixer, and if you are feeling extra lazy (like I always am), you pop the bananas in with the rest of the batter and save yourself a mashing bowl! Its a great way to use up excess bananas, which for some reason we always have loads of! I think I buy lots with great intentions, then don't use them, and end up having to make something with brown bananas. Which always goes down well with the other human in our house - I've seen him eat an entire loaf in about twenty minutes. I like the outside of the bread quite dark and caramelized. If you prefer it a little lighter, feel free to pop a piece of tin foil over the top of the pan once it reaches your desired level of brownness. Preheat the oven to 350f/180c. Grease and flour a loaf tin. In the bowl of a stand mixer or with an electric mixer, cream the butter and banana together until light and fluffy, 3-5 minutes. Add the eggs one at a time, beating well after each addition. Add the vanilla and mix well. Scrape down the bowl. In a separate bowl, sift together the flour, sugar, baking soda, baking powder, and salt. Add the dry ingredients to the creamed mixture. Mix until just combined. Scrape into the prepared loaf tin. Bake for 50-60 minutes, checking for doneness after 50 minutes. A skewer inserted in the middle of the cake should come out clean, and it should spring back when pressed lightly. If you do not want the bread to become dark, cover the top of the tin with tin foil once it has reached desired shade of brown. Remove from the oven and let cool in the tin for 15 minutes. Turn out onto a wire rack and allow to cool completely. Best served in thick slices, with good quality butter.